Order your copy today, at a 25% off savings. The pre-publication price is $289.00 until May 1, 2018. After that the list price will be $369. 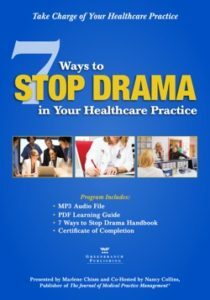 For practice leader Reanna, it is the micromanaging physician owner who doesn’t support her even after agreeing privately to do so. 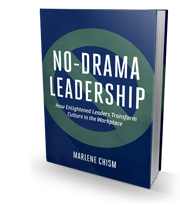 No matter what situation you are facing in your healthcare practice, after completing Marlene Chism’s program, you will have a better understanding of the cause of the drama in your office and the skills that will enable you to rip drama out by the roots. 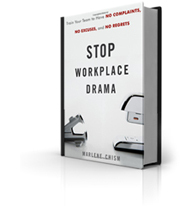 Marlene Chism is a speaker and author of Stop Workplace Drama (Wiley 2011) and No-Drama Leadership(Bibliomotion 2015) and the founder of “The Stop Your Drama Methodology.” As a gifted speaker, creative problem solver, and engaging story teller, Marlene simplifies complex topics to educate and engage healthcare practitioners, associations, and corporations nationwide.